The 11th day of September is a special day in the hearts of many Scots who have an interest in our nation's history. That day 712 years ago in 1297 saw the might of a foreign invader defeated by the people’s army of Scotland, raised and led by William Wallace and Sir Andrew de Moray. 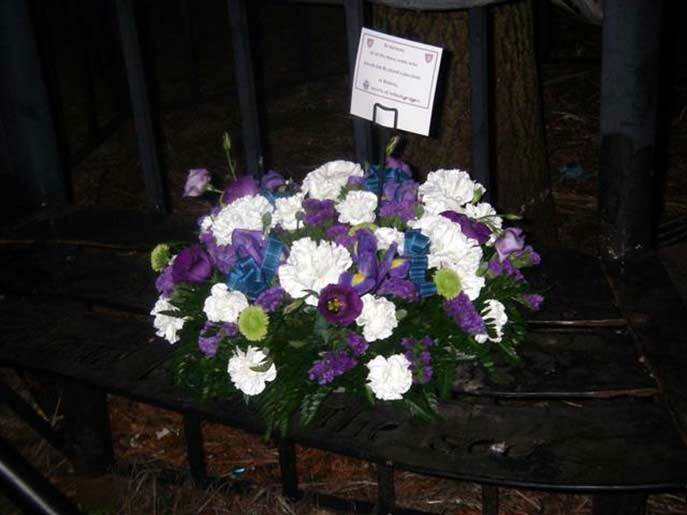 Scotland’s 11/09 now shares its place in History along with a more recent 9/11 where an act of Terrorism was carried out on the native soil of a nation by those foreign to it. There can be no comparisons other than to say that Scotland’s 11/09 is a date remembered for its victory over those foreign to it. A victory over tyranny and oppression by the people’s army, a victory that was to send a message that the people of Scotland were not going to stand aside and take what a foreign power had planned for it. 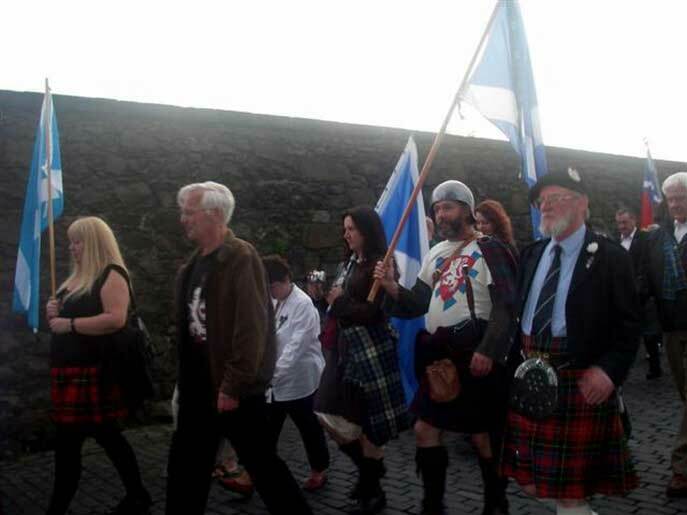 How relevant it is to look back with pride to the way that the battle of Stirling Brig came about and how that victory was won and how on Friday the 11th of September 2009 a people’s army were to gather at Stirling Castle to march in honour of those who fought and died that very day. Gathering as light began to fade at the Stirling Castle Car Park it offered a superb view of the field of battle below from the old stone bridge, one could visualise the old stone causeway that led to the Abbey Crag. There high on the crag the Wallace Monument standing proud in the early evening sunlight behind which the men of Scotland had gathered all those years ago. 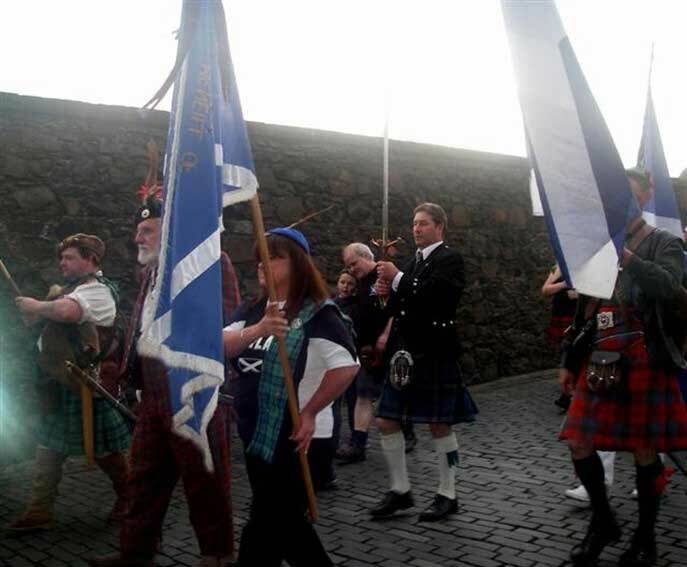 Groups, men, women and children from all over Scotland formed up behind the pipe band that was to lead them to “The Brig” and that very field of battle. 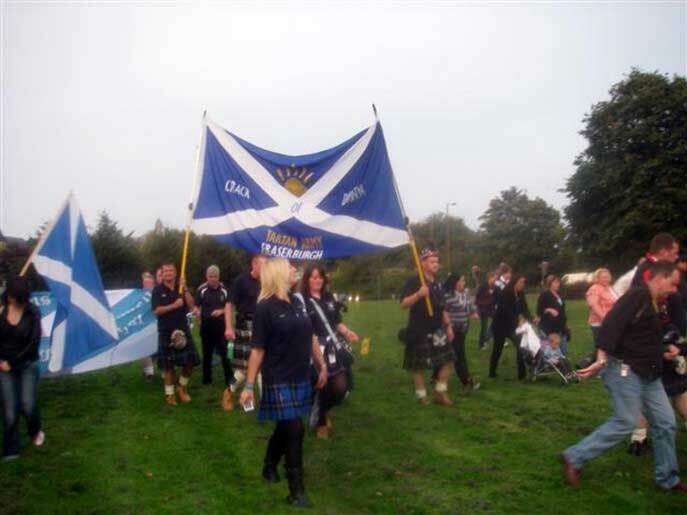 The Society of William Wallace, Crann Tara, Siol nan Gaidheal, Rampant Lions TA, The Crack o' Dawn TA, Armadale, Sons of Wallace TA, Andrew de Moray Project were just a few of the many who made up the march. 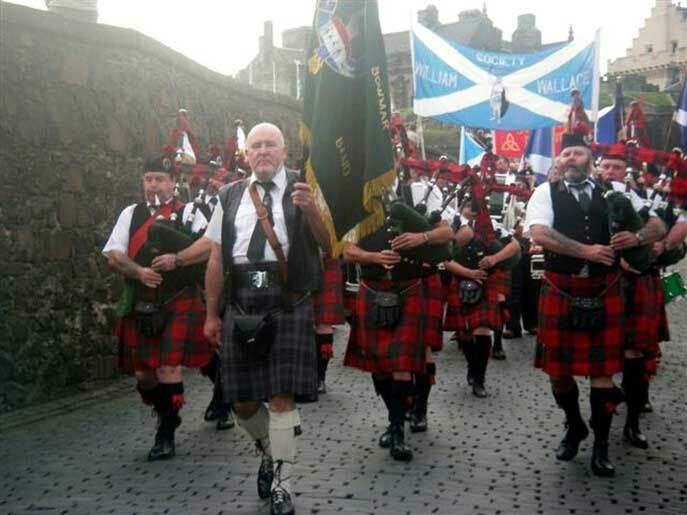 To the sound of the pipes of the Alloa Bowmar Pipe band pipe band, the marchers followed the route down from the Castle to be greeted by the many tourists and locals who lined the streets. Saltire flags and banners held high with the huge Rampant Lions banner carried over many passing cars to the wonderment of those inside them. Local pubs emptied on route and the marchers were greeted to rounds of applause as they passed by. On to the auld stone brig built early in the 1400’s to replace the timber bridge slightly upstream and made famous as the Battle of Stirling Brig. 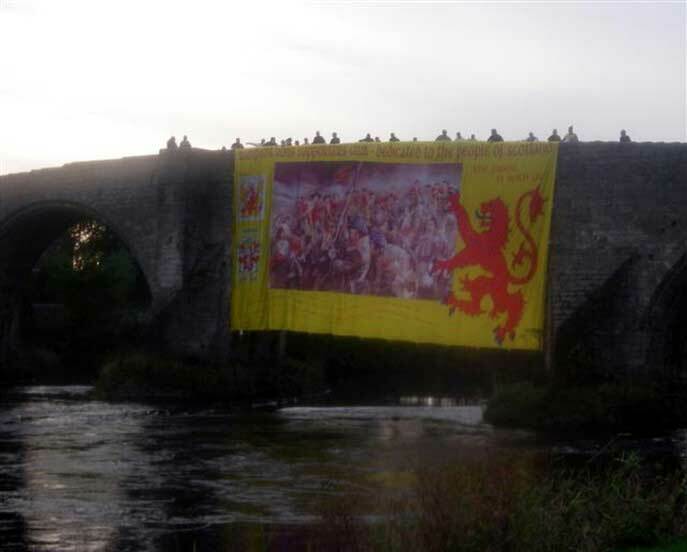 The marchers made a great spectacle with banners flying as they crossed the old medieval bridge to gather around the commemorative oak tree planted to mark the 700th anniversary of the battle. The large crowd were welcomed by the organiser Ted Christopher who introduced the guest speakers in a rousing opening few lines that set the tone for the remainder of the ceremony. 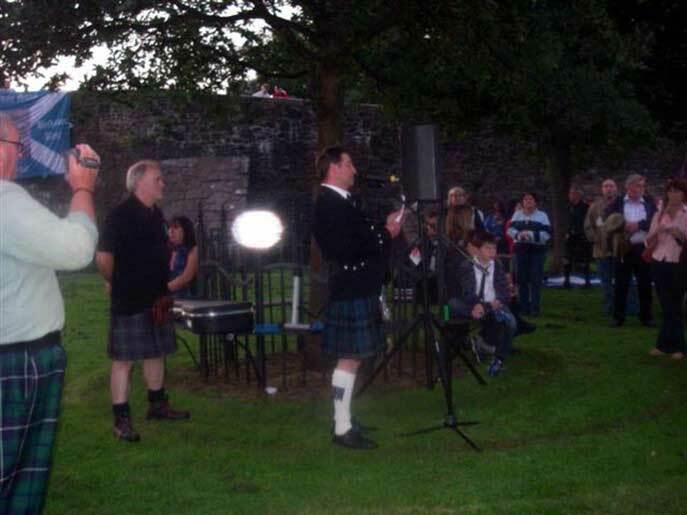 Duncan Fenton on behalf of the Society of William Wallace then spoke of the way in which the victory at “Stirling Brig” related to today’s fight for Freedom and the unfortunate death of Andrew of Moray of wounds taken at the battle which was to be a great loss to the campaign that followed. Fergus Wood the SNP Provost of Stirling then produced an excellent speech, thanking those in attendance from Nova Scotia and confirming the Scotland of today own a great thanks to the likes of William Wallace and Andrew of Moray and the many who fought and died that day. 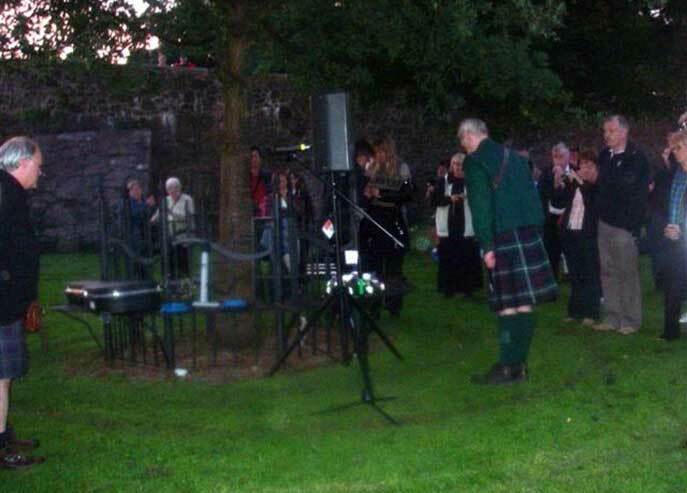 A wreath was laid at the base of the Oak tree with a piper playing the lament. 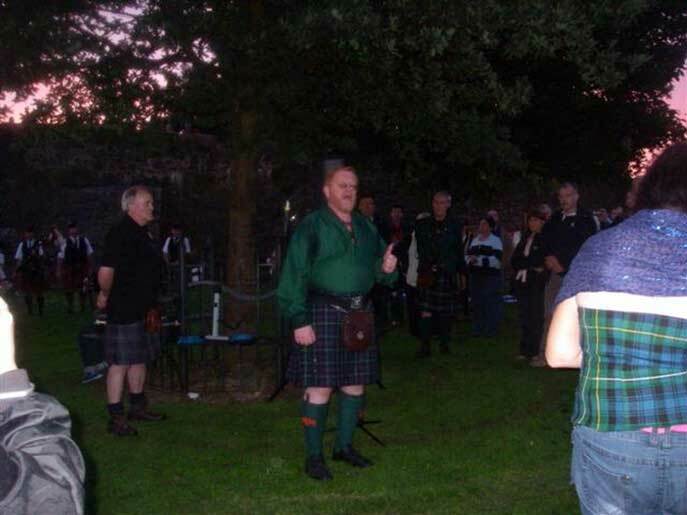 Ted closed the ceremony by thanking all in attendance with an invitation to join him at the ceilidh over the road in the Stirling Rugby Club. The large crowd slowly dispersed to the strains of “Scots Wha Hae” on the pipes. 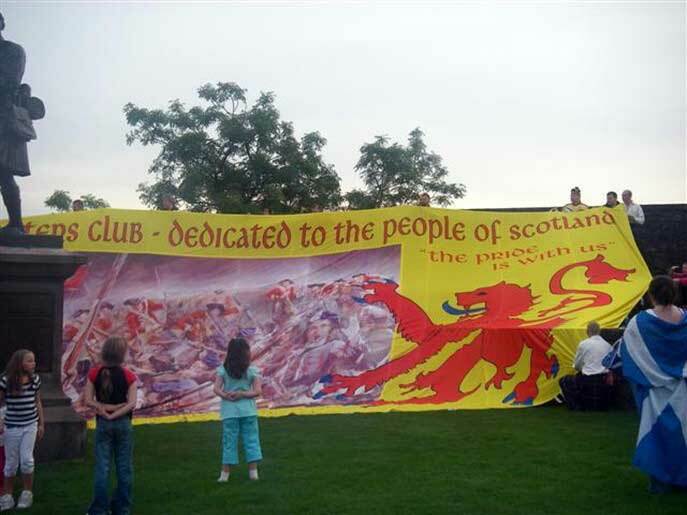 The fantastic Rampant Lions flag! 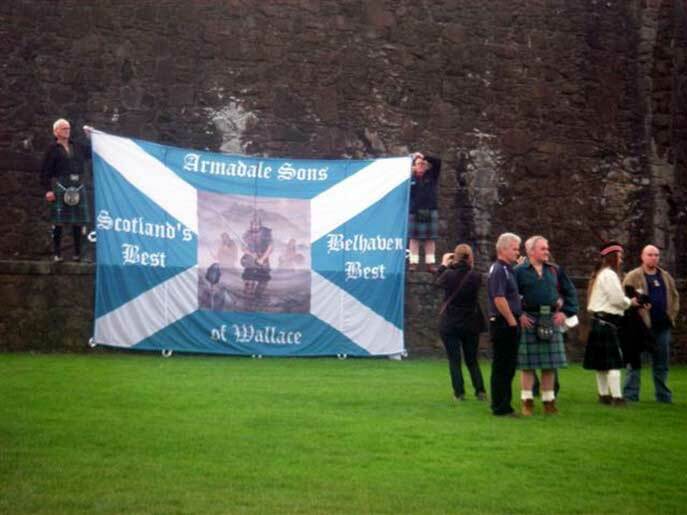 This commemoration is growing in stature with every passing year and Ted Christopher and The Society of William Wallace are to be congratulated for the way in which this most famous event of Scotland’s History is now being given the recognition it deserves. Good also to see members of the Tartan Army Groups out in force for this and if only half of the Tartan Army membership turned up to events like this there could be more than 15,000 people there. Roll on next years commemoration. 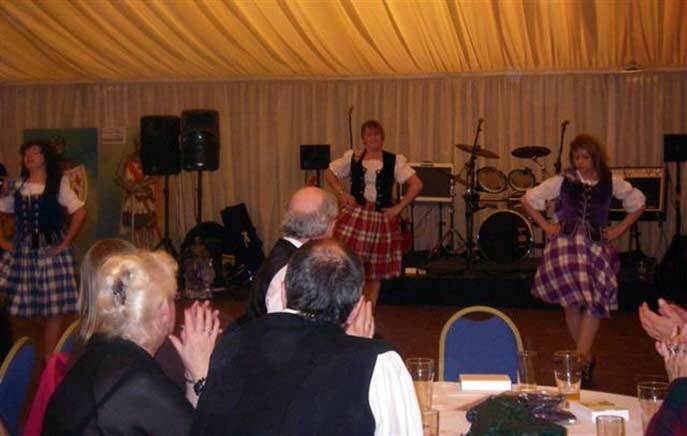 After the Commemoration we all made our way to the Stirling Rugby Club where Ted Christopher had organised an evening of entertainment. Little did we know at this stage what a special night this was going to be. We started off with Ted on his own, singing some of his old favourites, then we had the girls from Celtic Storm doing their Highland dancing along with piper Philip. They put on an excellent show and were rewarded with a big ovation from the crowd. 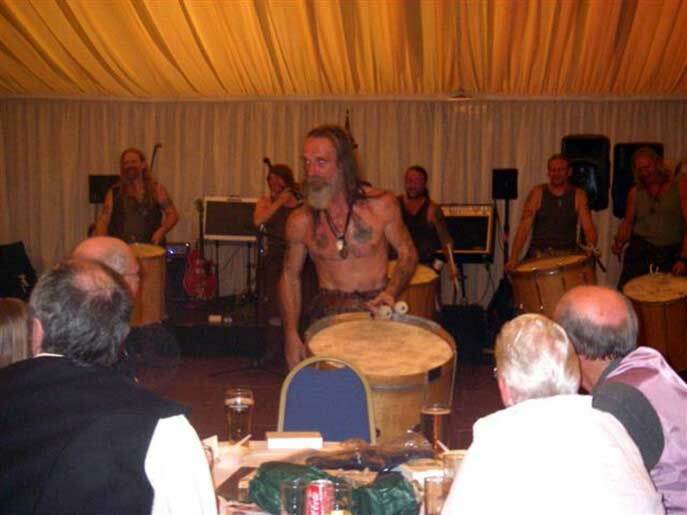 Clannadonia gave us a taste of the tribal drumming before we all sat down and had some stovies and the raffle. Straight after that Ted along with the Bannockburn band played a lot of Scottish dance music which went down very well in the hall. 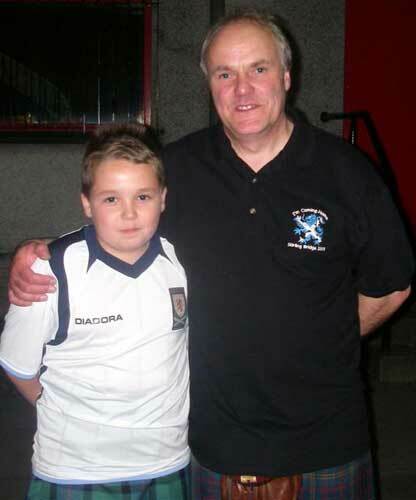 Then to set the boys and girls from the various groups of the Tartan Army we had the Tartan Specials. Once they finished the Bannockburn band took the stage and I have never seen a place erupt as it did, the atmosphere was unreal, something you had to experience to believe it. I don't think anyone remained in their seats for the last half hour. They were brilliant. Well done to all the groups that were present, I am not even going to try to name them all as I don't want to forget one and offend someone. But this has to be the greatest night ever, well done Ted and the boys in the band. I know Ted had a sell out tonight but please remember to order your tickets next year as we will all be coming back for this gig and you don't want to be locked out. We would like to thank everyone who contributed to this report, especially Bonny for the photos & Crann Tara, thanks everyone.